On the 26th of September, we were delighted to be joined by Bank of England economist, Rob Elder. 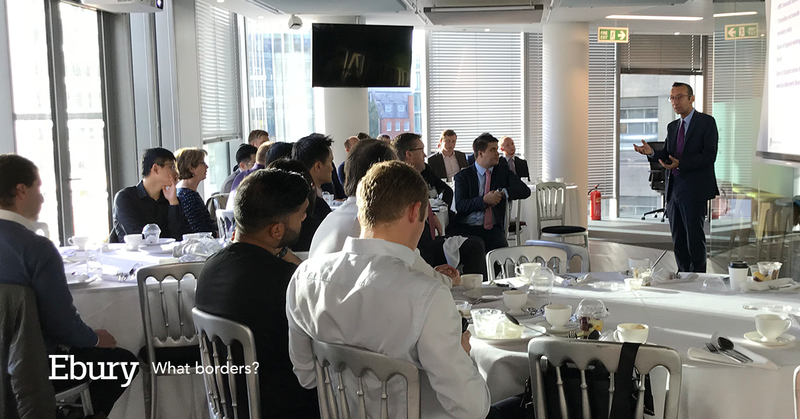 ur clients and new associates joined Ebury’s UK front office team in our London headquarters for an in-depth presentation on the bank’s latest monetary policy decision, and its view on the overall health of the UK economy. Rob discussed the UK’s sluggish productivity growth, implications of recent above target inflation and evidence of slightly stronger-than-expected near term growth, including an outline of the MPC’s macroeconomic predictions for the upcoming year. Attendees had a chance to quiz the senior Bank of England official directly, leading to some insightful and compelling exchanges. The main function of the Bank of England’s Monetary Policy Committee is to keep inflation close to the 2% target. As part of that remit, it needs to closely monitor developments in the foreign exchange market. A major event risk that continues to dominate the headlines and significantly impact the Pound is that of Brexit. Sterling has become increasingly volatile in the lead up to the crucial 17-18th October EU summit, seen as the deadline for a divorce deal to be agreed. The now very realistic possibility that a Brexit deal fails to be struck before the 29th March exit date could, in the view of Ebury’s analysts, lead to a fairly significant sell-off in the Pound. See attached for our special one page report on how a ‘no deal’ Brexit could impact the Pound. We at Ebury pride ourselves on supplying our clients with valuable market insight that helps them navigate the uncertain and often complex world of foreign exchange. This event marks the first in a series of Ebury organised events focussing on giving our clients access to such expert knowledge. We would like to extend our sincere thanks to everyone involved in the event. Look out for our next invite! To find out more, please contact us on +44 (0) 20 3872 6670, or fill in the Contact Us form.